Each year in the Advent season Stuttgart's visitors from all over the world will find a fascinating, sparkling Christmas city. 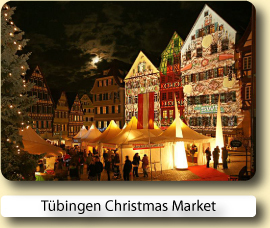 Its main attraction is the Stuttgart Christmas Market, set in the heart of town against the breathtaking backdrop of the Old Palace. With its more than 280 delightfully decorated stalls the Stuttgart Christmas Market is not only one of the oldest, but certainly also one of the largest and loveliest Christmas markets in the whole of Europe. Its festive illuminations, the wonderful scents of cinnamon and vanilla, the wooden chalets, richly adorned with angels, conifer branches and Christmas ornaments, not to mention the "Wintertraum" winter wonderland on Palace Square, create a nostalgic Christmas ambience which enthrals millions of visitors each year. 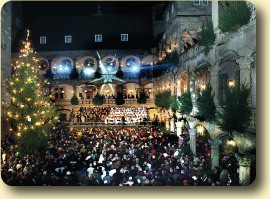 In the Renaissance inner courtyard of the Old Palace, daily concerts of Christmas music put guests from far and near in the right spirit for the contemplative Advent season. 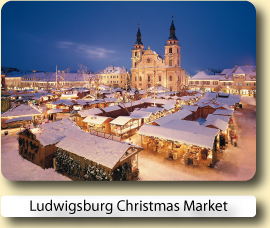 All around the Old Palace, on Schiller Square and the marketplace, the stallholders in their decorated wooden huts have an overwhelming range of Christmas items and gifts on sale, from 10 a.m. to 9 p.m. on weekdays and 11 a.m. to 9 p.m. on Sundays. There's no shortage of culinary delights, either, and it's hard to choose between roasted chestnuts, gingerbread, candied almonds, Swabian specialities, fried sausages and mulled wine. 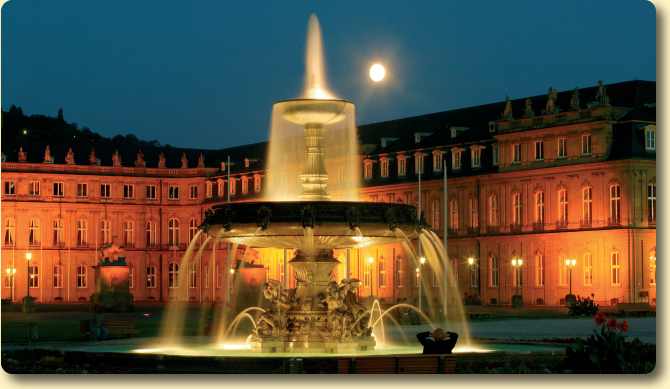 Stuttgart is a vibrant city with top-class art and culture, appealing leisure activities and fantastic shops. 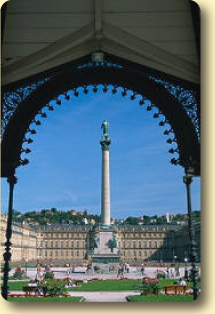 Stuttgart is at the centre of one of Germany's foremost economic regions. 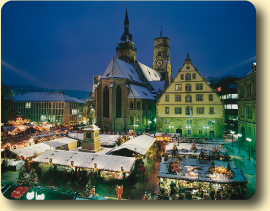 What’s more, the people of Stuttgart really do know how to throw a party - the lively Stuttgart Beer Festival, the traditional Wine Festival and the atmospheric Stuttgart Christmas market are just three of its popular events. A stroll through Stuttgart's city centre is like taking a journey back through the history of architecture, with masterpieces such as the medieval Old Palace, the baroque New Palace, the beautiful Art Nouveau market hall and the Bauhaus-style Weissenhof housing estate giving the city its distinctive feel. For people who enjoy good food and drink, Stuttgart is an excellent choice, as Swabian specialities such as Spätzle noodles and Maultaschen (giant raviolis) are served at many of its restaurants and cosy little taverns. There is also a wide choice of great wines as the city is in fact surrounded by vineyards. Stuttgart is home to two of the leading names in the automotive world, Daimler-Benz and Porsche – both of which have erected spectacular museums in the city. The breathtaking Mercedes-Benz Museum looks back on some of the finest feats from the world of mobility. No fewer than nine floors are needed to display a total of more than 1,500 exhibits tracing the unique history of the brand. Visitors can learn all about the legendary Porsche at the Porsche Museum in Zuffenhausen. The exhibition space at this dazzling white museum is held up by just three pillars and looks as if it is about to take off. Even during construction, its bold architecture grabbed the headlines. Good value for its position across the road from rail station. Clean comfortable quiet with good bedding. Staff were polite and helpfull. This a very nice hotel that is located just a short walk away from the main shopping area in Stuttgart. The checkin was really friendly. The room was nice and comfy and we really liked the beds. The rooms are high standard and quite affordable..the hotel is just a 10 mins walk from the Koenigstrasse...also like the idea of the two fresh apples in each room. Very clean and comfortable rooms, exceptional good dinner menu with local food. Nice swimming pool/sauna/spa area. Breakfast is perfect. Restaurant and bar is quite expensive. 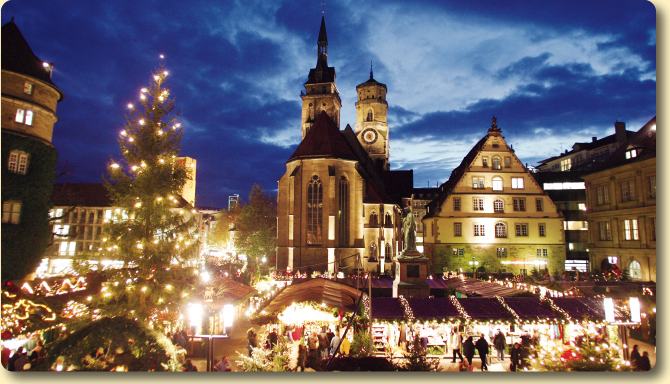 Book your hotel for the Stuttgart Christmas Market with Expedia or Hotels.com.Both online reservation services will let you compare and book hotels at great low prices.